Keeps two levels of hoses in order. 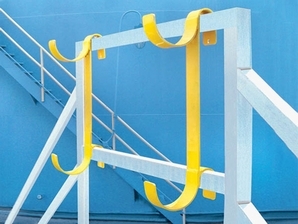 Aluminum rack hooks to car platform railing. Holds 4" dia. hose. Racks are sold as individual units, not as pairs. • Weight 5 lbs.per piece.